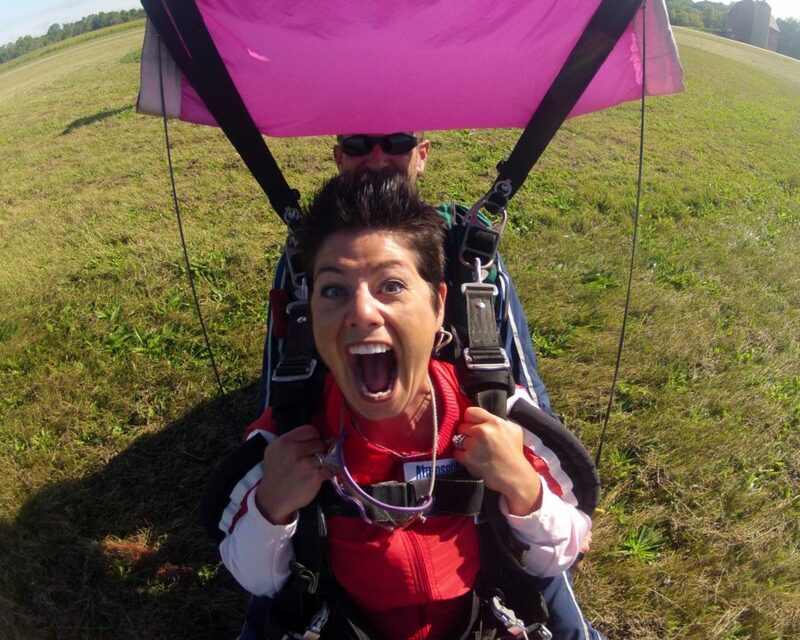 What To Know Before Your Skydive! 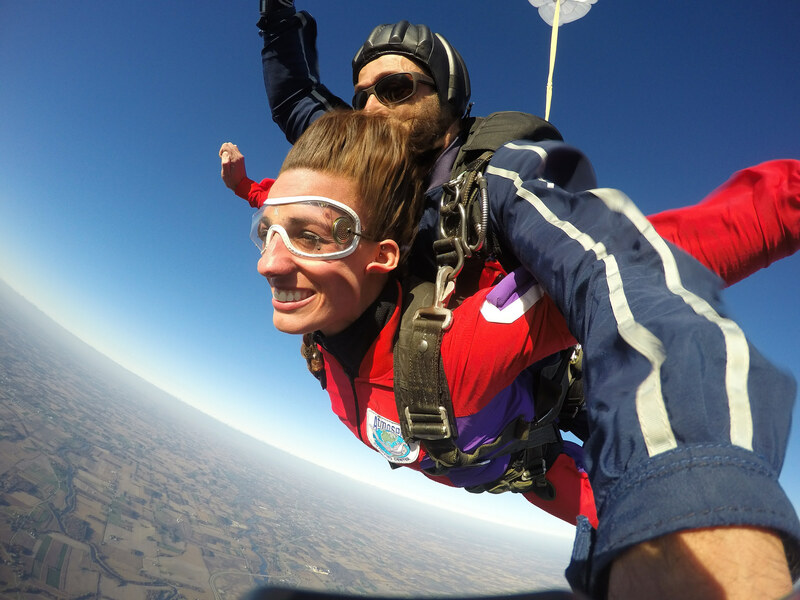 Thanks for scheduling your tandem skydive with us here at Wisconsin Skydiving Center! In the interest of making your experience as safe and smooth as possible, we have created this list for you to help you with your skydiving preparations. Please read through all of the details prior to your arrival. Photo ID is a must. Bring your friends and family. Please, no dogs allowed at the airport. Feel free to use our gas grill, bring coolers, food, etc. Make a day out of it! If you are using a jump voucher or gift certificate, you must bring it with you also. Sneakers are a must. Shorts and t-shirts for warm days. For cooler weather, layers of thin clothing are better than bulky cargo pants or hooded sweatshirts. Eyeglasses and contact lenses are fine, we will provide you with goggles for the jump. Kindly arrive 15 minutes before your scheduled time in order to complete paperwork prior to training. 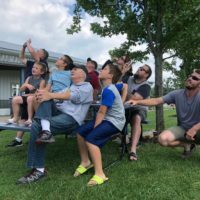 Go to the Directions page for an accurate step-by-step route to the Wisconsin Skydiving Center dropzone. Please note we are unable to provide directions over the phone on the day of your skydive as our staff will be involved with training and skydiving. We recommend printing out directions prior to your trip or mapping them in your phone or GPS. Weather forecast change constantly. We can not make any weather decisions until the day of your skydive. We will contact you two hours prior to your reservation time to reschedule your jump if the weather is not cooperative. Please have your phone with you and be sure to double-check the phone number and email address you have entered in our system. If you have not heard from us either via email or phone, are uncertain about the weather or live farther than two hours away, feel free to call us before you get on the road. If we need to reschedule your appointment due to weather, you WILL NOT LOSE YOUR DEPOSIT, we will simply transfer it to the date which you reschedule to. Deposits do not expire and will carry over to next season if necessary. Also – what if it’s cold? We do not accept checks. All of our prices are cash discount prices. If you would like to pay with a credit card, we accept Visa, MasterCard, Discover, and American Express. There is, however, a 4% surcharge for using a credit card. There is no ATM at our facilities, so please bring any cash needed. Exiting from a lower altitude minimizes parachute opening forces. Lower exit altitude = lower terminal velocity = softer deployment of the parachute. Heavier students are more demanding on our instructors and for our equipment during exit, opening, and especially during landing. WSC feels it is only fair to compensate our instructors for that extra workload. Learn more about skydiving weight limits. Deposits are not refundable. You may change the date of your reservation with no penalty if you do so at least 10 days prior to your scheduled appointment. Most people choose to get a video (on DVD or USB) and still images (on CD or USB) of their skydive. These tell the story of your tandem skydive: your training, gear up, boarding the aircraft, the flight to exit altitude, climb out and exit, freefall (the videographer is only a few feet away from you in freefall), the parachute flight, the landing and all the euphoria after your feet touch the ground. If you’re unsure about getting video at this time, you can always decide to get video when you arrive at WSC, on the day of your jump. The cost for one (either video or digital photography) is $89 and for the package with both Video and Photos is $109. We offer an upgrade to our branded USB lanyard for an extra $10. Find out more here. What time should spectators arrive? It is recommended that spectators arrive at the same time as scheduled jumpers. We are unable to establish the order in which everyone skydives until all guests have arrived, registered, weighed in and identified their choice of photo + video package. We fly multiple airplanes and there are multiple variables that determine the order. We respect everyone’s time, and we work to get everyone up as quickly as possible. But we ask that spectators and jumpers arrive together with the mindset of enjoying the day! There isn’t a snack bar on site. Spectators are encouraged to bring food and drinks! We have grills and many groups BBQ while watching skydivers jumping throughout their time at our facility. Should I eat before arriving for my skydive? We recommend eating a light meal beforehand. Avoid eating heavy foods or anything that might upset your stomach. Do people get motion sickness? Nobody has ever gotten sick in freefall. People susceptible to motion sickness may feel queasy once the parachute opens. If you have any concerns, take your regular motion sickness medications prior to your jump and inform your instructor. Is it customary to tip my instructor? While our staff never expects to be tipped, it is welcomed and much appreciated. If you feel we did an excellent job and exceeded your expectations, tips are good karma. If there’s something you think we could do better, please let us know either before you leave, or by emailing us at info@WisconsinSkydivingCenter.com. We strive to keep WSC top notch and your input is always appreciated. Can two people share one video? Not really. 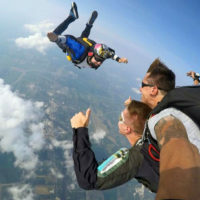 Two people can be in each other’s videos during the gear up and during the airplane ride, however, during exit and freefall you will be so far apart that its impossible to film both of you at the same time. Freefall is the most valuable part of the experience, and therefore, the best part of your video! If I have a GoPro camera or a similar small camera, am I permitted to bring it with me on my skydive? We hope this has answered your questions as to what to expect and how to prepare for your upcoming skydive. Please visit our FAQ page for answers to more questions.